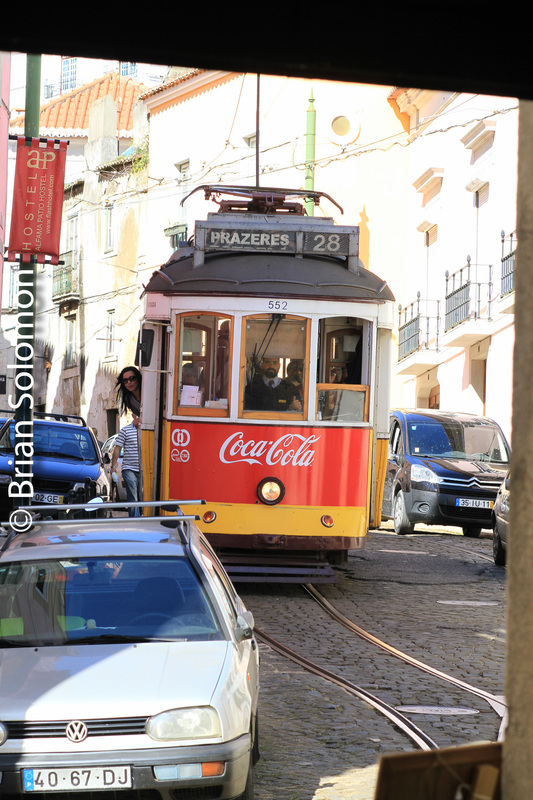 Back in 1996 a European friend said to me, ‘you ought to visit Lisbon, they’ve got some wonderful old trams there.’ Some 18 years later, I finally ticked off that box in my notebook. Better late, than not at all. Lumix LX3 photo; Lisbon April 6, 2014. 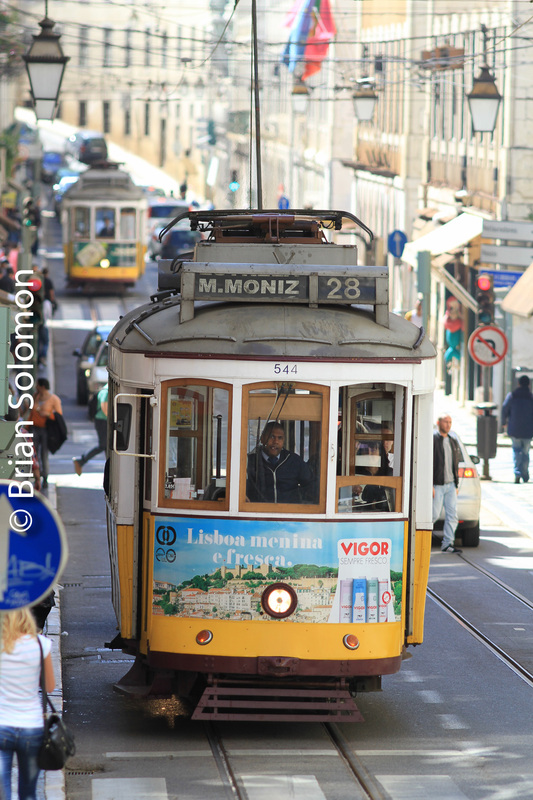 Lisbon is famous for its narrow gauge trams that crawl up narrow and steeply graded streets. This track work is amazing. It’s amazing that it was ever built, and even more so that some of the lines are still worked in 2014! The old trams are of course a tourist attraction, but like San Francisco’s cable cars, these function as part of the transit system. Visitors queue to board, much to the delight of local pickpockets. I was forewarned about light-fingered activities, so I took precautionary measures. And, also made a sport of spotting the picks. Not to point fingers, I saw nothing lifted, but I saw some suspicious characters in the queue (who didn’t seem to have any interest in riding a tram). 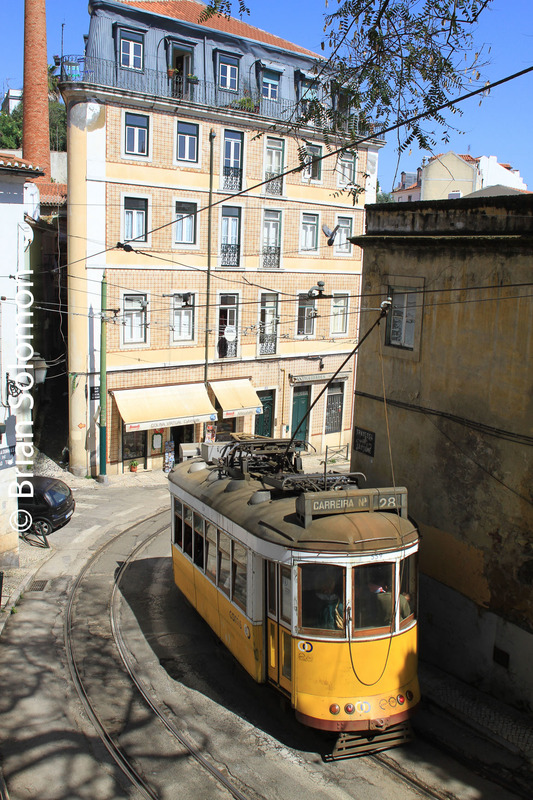 Steep gradients and colourful old buildings are part of the attraction of Lisbon’s tram network. They wouldn’t have the same charm serving suburban tower block apartments. 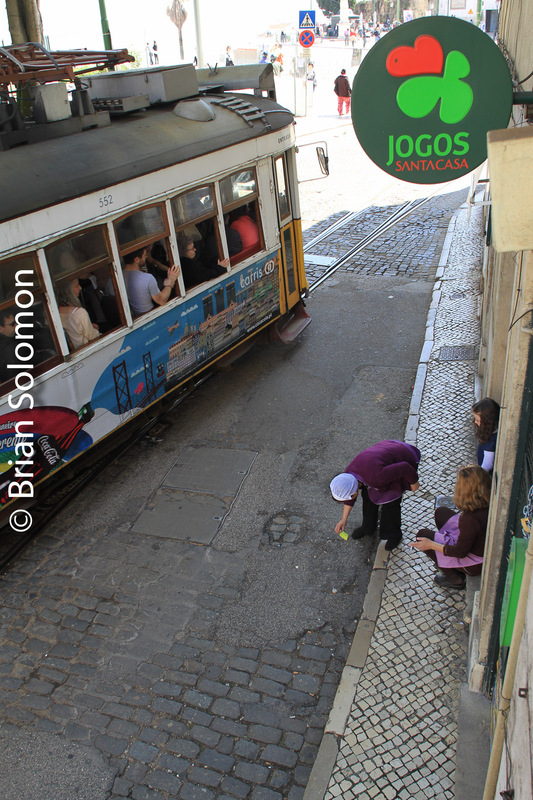 A tram works up hill by Lisbon’s cathedral. Canon EOS 7D photo. The red trams worked a tourist circuit. Canon EOS 7D. Lumix LX3 photo; Lisbon April 6, 2014. Tram traffic jam. 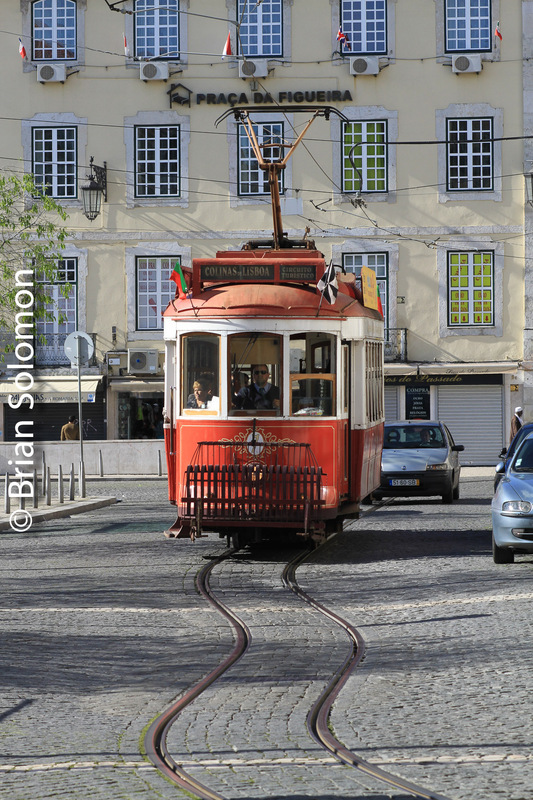 The quirky old cars are enhanced by the colorful tapestry that makes up Lisbon’s old city. Sunny skies were delivered as ordered. Route number 15 is populated by modern LRV style cars, but passes through some interesting areas and runs parallel to an old heavy-rail commuter rail route. Modern cars work line 15. Trams tend to get bunched up in traffic and seem to appear in waves of three or four cars all at once. Canon EOS 7D with 200mm lens. Narrow alleys have barely enough room for single track. Yet, this is a bidirectional line with cars and trucks too. Canon EOS 7D. View from the door of a track-side cafe. Canon EOS 7D with 100 mm lens. This car works interlaced track where up-hill and down hill lines overlap. Careful, mind the Volkswagen! Canon EOS 7D. Tomorrow: Looking back on a Clocker. In the Rain and Underground. Trindade Station, Porto. Exposed with a Lumix LX3. Ah yes, sunny Portugal! Wall to wall blue skies . . Er. . . wait, no, actually it was cool, dark, and pouring rain in Porto. Portugal’s second city. As Cork is to Dublin; Porto is to Lisbon. And with a really long history too. The Romans were here a while back. In 2002, Porto opened its Metro, which is what I’d call a trolley-subway. Or, tram-subway, if you prefer. It is well patronized, and well run. On the day I visited, it was also exceptionally wet! But heavy rain can make for interesting photos, so I made the most of the circumstances. Trindade on Porto’s Metro. Exposed with a Canon EOS 7D with 100mm lens. Pan in the Metro. Canon EOS 7D. Tram interior, exposed with a Lumix LX3. At Senhora de Hora in the rain. Canon EOS 7D. My Canon didn’t like the rain. Seta Bicas. Canon EOS 7D. Gliding into a tunnel near central Porto. Canon EOS 7D. Tomorrow: Porto and Paris have this in common . . .
Entroncamento Station, Portugal on the evening of April 3, 2014. Portugal shares the broad Iberian standard gauge with Spain: rails are five feet six inches apart. Despite this commonality, today there are relatively few international services between the two countries. One of the few cross-border trains is the nightly combined Lusitania/Sud Expresso connecting Lisbon with Spanish cities. The Lusitania runs Lisbon-Madrid, while the Sud Expresso is a vestige of the old Wagon Lits luxury express that once connected Lisbon with Paris, but now only goes as far as Irun on the Spanish-French frontier. The train operates with RENFE (Spanish Railways) TALGO train hotel equipment, which makes it anomalous compared with the majority of Portuguese passenger trains. On April 3, 2014, I planned to photograph the eastward Lusitania/Sud Expresso (train 335/310) during its station stop at Entrocamento, Portugal. This is a big station, adjacent to freight yards, shops, and Portugal’s National Railway Museum. Entrocamento Station with the nightly Lisbon-Spain train hotel approaching in the distance. Exposed with a Lumix LX3 set at 80 ISO. The train departed Lisbon Santa Apolónia at 9:18 pm, and arrived at Entroncamento a little more than an hour later. I had less than five minutes to make photographs. I worked with three cameras. First exposing digital time exposures using my Lumix LX3 positioned on a mini Gitzo tripod. I made several images using my standard night photo technique (see: Lumix LX-3—part 2: Existing Light Digital Night Shots). Entrocamento Station with the nightly Lusitania/Sud Expresso paused for its station stop. Exposed with a Lumix LX3 set at 80 ISO. I used the self timer set at 2 seconds to minimize vibration. Then I quickly swapped the Lumix for my Canon EOS 3 with 40mm lens loaded with Provia 100F, and made a three exposure bracket. With film, I find it difficult to gauge night exposures, so I aided my efforts with my handheld Minolta Mark IV light meter. Provia 100F has a filtration layer that minimizes undesirable color spikes caused by fluorescent and sodium lighting. In the middle of this time-exposure exercise, I also made several handheld images using my Canon EOS 7D set for a high ISO. I figured that covered most of the angles. I exposed this view of the Lusitania/Sud Expresso using my Canon EOS 7D handheld with a 20mm lens; ISO 4000 f2.8 1/50th of a second. While not as critically sharp as the tripod mounted Lumix image, it has a nice feel to it. Also, for me it’s a fast and easy ‘safety’ shot, in case my more elaborate technique using the Lumix failed to work as hoped. I was distracted during my efforts by the arrival of a Takargo Vossloh E4000 diesel (powered by an EMD 16-710 engine) hauling a container train. As soon as the train hotel pulled away, I repositioned to photograph the diesel-hauled container train. Takargo Vossloh E4000 diesel rumbles in the sodium vapor gloom of Entrocamento. Lumix LX3 photo. Lisbon : Why Do Americans Continue to Ignore Portugal?